Just as Kalsubai boasts to be the highest peak in the Sahyadris in Maharashtra, Salher has the distinction of being the highest fort in the Sahyadris. Baglan is the fertile region being fed by the rivers Mokshaganga and Akshaganga. This is one of the areas rich in agricultural productivity, forests and wealth and the villagers here are quite well to do. Still, there are tribes like the Kokan and Bhils living on these hills. The perimeter of the Salher fort is around 11 Kms encompassing an area of around 600 hectares. The Salher fort is famous and known as the main place where Parashuram did his penance. After winning the earth and giving it as donation, he made land for himself to live in, by pushing the sea back with his arrows, right from this place. An ancient and historically significant place like this is also famous for its battles during the reign of Shivaji. The fort of Salher was captured by Shivaji in 1671, during his campaign of the Baglan region. This news reached the Mogul emperor in Delhi. He got incensed with this news and said �I have sent lakhs of cavalry but they have come back shamefully, now whom do I send?� The emperor then decided �As long as Shivaji is alive, we are not leaving Delhi�. He then called Ikhlaas Khan and Bahlol Khan and sent them with a cavalry of 20,000 horses to attack Salher. Ikhlaas Khan then laid siege of Salher Fort. When this news reached the Maharaj, he sent message to his Commander in Chief Prataprao through his secret agents �Go to Salher with your troops and drive off Bahlol Khan�. He also sent a parallel letter to Moropant Peshwa to go from Varghati Konkan along with his troops and meet Prataprao near Salher. As planned, both Prataprao and Moropant rode to Salher from both sides and a fierce battle ensued. Writings of Sabhasad Bakhar describes it as follows:�There was a fierce battle throughout the day and night, Mughals, Pathans, and Rajput, Cannons, Elephants, Horses and Camel troops fought alongside each other. The battle was so fierce that the dust which was raised by the troops rose up in an area of 3 kms and the troops could not recognize who was fighting on which side. The Elephant troops arrived and both sides saw 10,000 troops perish and blood flow like rivers�.The Marathas defeated Ikhlaas Khan and Bahlol Khan in this bloody battle, which saw tremendous destruction all over. There were 1,20,000 troops of Raja Shivaji and it returned 10,000 less, lost in battle. Shivaji�s troops captured 6,000 horses, 6,000 camels, 150 elephants, heavy gold ornaments, gold coins and expensive cloth from the enemy troops. The maratha soldiers showed extreme courage during this battle. Moropant Peshwa and Prataprao Sarnaubat exchanged pleasantries. Suryarao Kakde became a martyr during this battle. He fell after being hit by a cannon ball. He was no mere soldier. A soldier who was as brave as �Karna of the Mahabharata� lay dead on the battlefield. Of all the face to face battles between the Mughals and Shivaji�s troops, the battle of Salher takes first place. Such a big battle was not won before. The bravery and strategy used by the Maratha troops in the battle spread far and wide and increased Shivaji�s fame much higher. After winning Salher, the Marathas also captured Mulher and established their reign over the Baglan region. Thus they became a nightmare for the Shah of Surat. One can see some dilapidated structures of some temples within 5-10 minutes after reaching the top, if we turn to the right when climbing the fort from Waghambe and to the left when climbing from Salherwadi. Just further ahead are two water cisterns and a bit further the Gangasagar Lake comes into view. Just next to the lake are the roofless temples of Renuka Devi and Ganesh. There are two routes ahead from this place. The one going to the right takes us right to a water tank. Near the water tank is a �Yagnavedi� or a construction in which yagnas used to be held. One can also find an idol nearby. The route climbing up from the temple leads us to three caves. There is a Maruti temple in front of the caves. We can stay in these caves. The route climbing up from near the caves takes us to the topmost part of the fort. On the top is the somewhat dilapidated temple of Parashuram having his idol and footsteps. One can see the complete Baglan region from this spot and the most fabulous scene of the surrounding region. This fort gains importance as it is on the trade route joining the Dang, Baglan and Gujarat regions. Ahead to the South one can see the Ajantha � Satmaal range, fort of Dhodap and the peak of Ikharya. 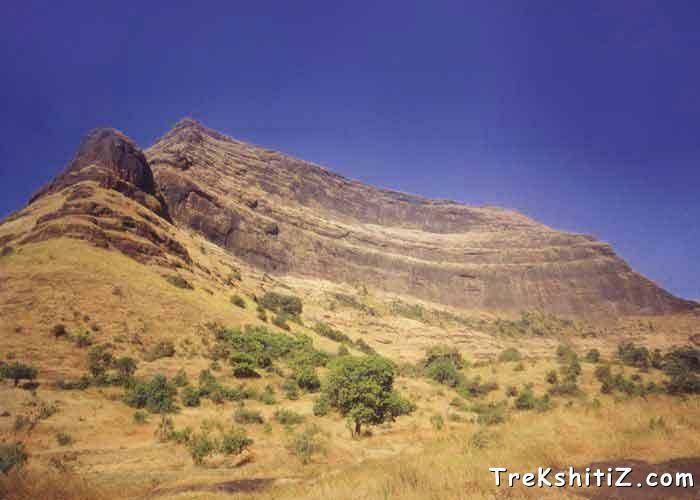 To the East are visible the peaks of Mangi�Tungi, Nhavigad, Tambolya, Hanuman Tekdi, Mulhergad, Hargad, Moragad and Salota. Right ahead the Dam of Haranbari grabs ones� attention. There are two major routes available to go to the fort. One has to reach Taharabad on the Nashik Satana Route. From Gujarat one can reach Taharabad via the Dang route. There are also S.T. and jeep services up to Waghambe via the Mulher route. As soon as one reaches the Waghambe village one can see the route leading to the ridge between Salher and Salota and the route leading to Salher. There is no water along the route and it is quite tiring too. It takes approximately 1 � hours to reach the fort. We come across four entrances on this route. Along the 3rd and 4th entrances, we see around 18-20 caves excavated on the rock face. There is also an inscription on the arch of the fourth entrance. Entering through this entrance, we see the vast plain of the top of Salher. The village of Salherwadi is ahead of Waghambe. One can reach Salherwadi via two routes. One is Satana � Taharabad � Mulher � Salherwadi route. The route going up to the fort from Salherwadi is quite tough and tiring. On this route we cross six entrances and reach the top of the fort in around 3 hours. The route is quite prominent and there is no fear of getting lost. There is no water in this route. One can stay at the three caves on the top of the fort. Food arrangements have to be made by the trekkers themselves. The water from the Gangasagar Lake and the two tanks near it is potable.